When grease is poured into the drain it leaves your house or business as a liquid, but it does not stay that way for long. 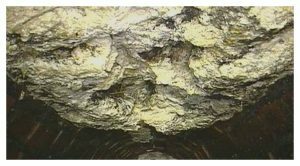 As soon as that grease is cooled or meets a cool object underground it becomes a solid again, quickly becoming a conglomeration with chemicals and debris before it sticks to drain pipes. Occasionally a fat and grease conglomeration will not cling to the pipes but will instead travel to the sewers below. Once there, they merge with all of the other fat and oils that have drained into the sewer creating what is termed a “fatberg.” There have been examples of huge oil and fat deposits, like a 130-metric ton fatberg the size of 11 double-decker buses that was found in a British sewer. When water levels rise though, these compounds stick to the ceiling to form stalactite formations and less and less actual water is able to seep out of the pipes. Fatbergs can clog entire sewers, sending raw sewage into the streets. 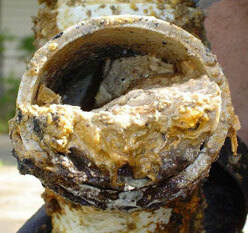 Grease build-up in sewers and drains has become a world-wide problem. The two biggest reporters of fatbergs and grease buildups are the United states and the United Kingdom. But in the US alone, there are 36,000 sewer overflows and backups that happen every year. And of these yearly overflows, it is estimated that 47% of them are caused by grease build-up in sewers and pipes. Grease build-up causes several costly problems, including slow drains, sewage backups, repairs, contamination of water, and contact with disease carrying bacteria. Last year, New York City reported a financial drain because of sewer backups, claiming that 71% were fueled by grease and fat clogging. The city spent $18 million dollars trying to rid themselves of there grease problems. Even small cities like Ft. Wayne Indiana still spent half a million dollars trying to undertake the same task. Unfortunately, MOPAC does not serve residential areas, so we will not pick up less than a drum of grease. For small amounts like when you fry bacon, save the grease in a glass jar and you can reuse it again until deemed unusable. When that is no longer possible there are Home Chemical and Recycling Centers that will accept them. For any business or industrial needs, we will accept an unlimited amount of used grease and old cooking oil.